Do your labels have a Dirty Little Secret? If you are storing them uncovered, or use them in a dirty, dusty environment without a proper enclosure, they just might. You see, when labels collect dust and dirt, then are run on an automated labeling system like a label applicator or printer/applicator, they can slowly and secretly cause equipment damage. You may not notice it, but that dust and dirt act like fine sandpaper, slowly wearing at print heads, rollers and gears and causing premature wear of those parts. Dust and dirt can also affect label adhesion if the contaminants come between the label and application surface. Labels are a Sticky Business! Think of a label like a sandwich. 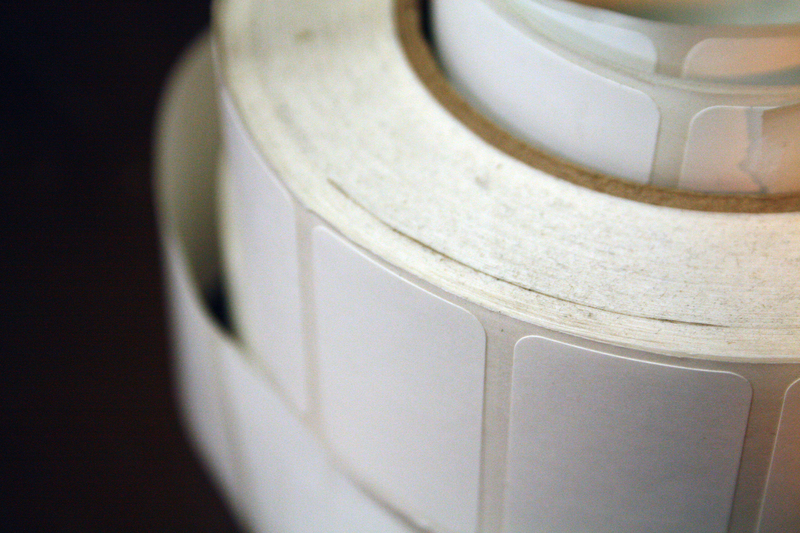 On top is the paper stock, on the bottom is the label liner, and in-between is the label adhesive – the sticky part. When label stock is converted to labels, the excess material is removed and you are left with the die cut label. You may also be left with some adhesive residue on the liner edges where the label stock and adhesive have been removed. Likewise, if labels are stored at too high of a temperature or wound too tightly, label adhesive can ooze from beneath the die cut label into the gaps or any die strikes. Any exposed or excess adhesive is like fly paper to dust and dirt. It all ends up on that adhesive! Additionally, paper stocks and liners have texture that dust and dirt can infiltrate and collect upon. All of this contamination isn’t good. Can you imagine what this does to your automated labeling or label printing equipment? Over time, it wears away at the print head, burning out elements and causing poor print quality. It grinds against sensors and rollers. It collects on the applicator head, blocking vacuum holes, and causing labels to fall off of the applicator. What Can You Do to Fix this Dirty Little Problem? The first step to ensuring good label stock is to keep it covered. Rolls should be kept in a clean environment. This could be as simple as keeping the labels in an enclosed box or plastic bag. If you have a dirty or dusty production environment, you should consider an environmental enclosure for your labeling equipment. Not only will this ensure that your labels stay clean, but it will also help keep the equipment clean too. Additionally, you will also need to keep your labels at the proper temperature and humidity to avoid ooze and other issues. Taking a few basics steps, such as those listed above, will help to keep your equipment and production running smoothly – with no more dirty little label secrets!